2:00 pm Friday Feb 22 – Special seminar (Assoc. Prof. Leanne Armand) – ANZIC IODP “Roadshow” arrives at USYD! The School of Geosciences, the GRG and Earthbyte will be hosting a special seminar 2:00-3 pm Friday Feb 22nd Geosciences, Madsen Building in the 449 Conference Room. Assoc. 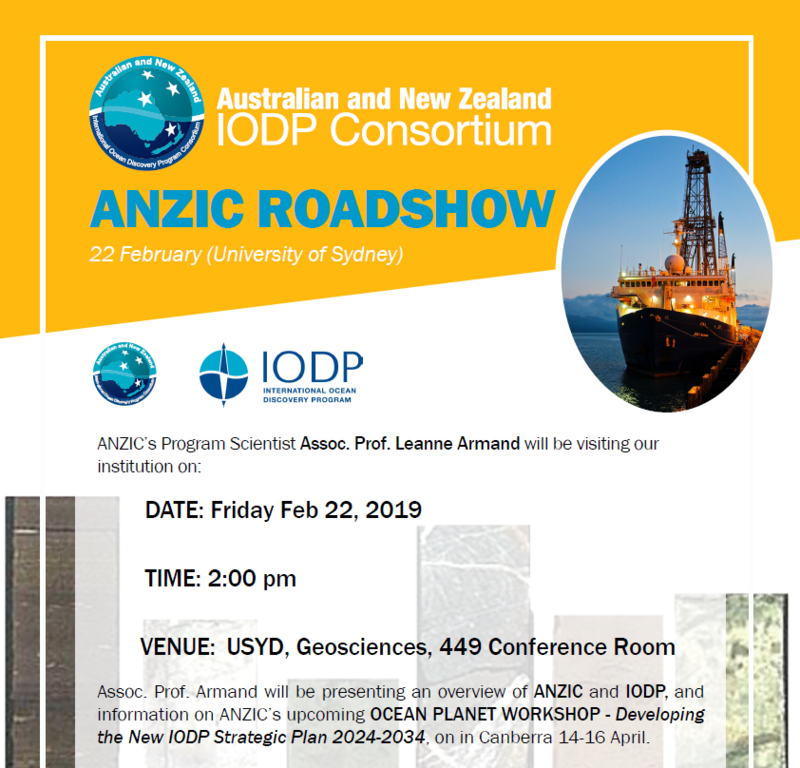 Prof. Armand will be presenting an overview of ANZIC and IODP, and information on ANZIC’s upcoming OCEAN PLANET WORKSHOP – Developing the New IODP Strategic Plan 2024-2034, on in Canberra 14-16 April. This is a unique opportunity to become aware of ANZIC – IODP and the current and future opportunities available to the Geoscience, Biogeo and Microbial communities. Please spread the work and come along if you can. ← GRG seminars starting next week! (12 Feb, Tues, 11:00 am, Petrology Lab 336) – QUT bio-geo reef & Halimeda bioherms special!